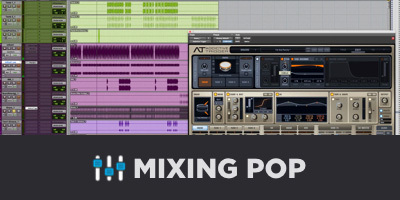 In mixing most types of music, EQs and compressors play a prominent role. You might begin your mix by getting relative levels set with volume automation and compression, then work on tonal balance. You might also start with making sure each instrument has its own frequency space in the spectrum, and then tackle compression and relative levels afterwards. Your signal processing chain (that is, the order of your plugins on each track) will most likely reflect the order in which you address different aspects of your mix. In this process you may have experimented with the order of two specific tools, the compressor and EQ. Does one necessarily affect the other? I use compression because it’s the only way that you can truly modify a sound because whatever the most predominant frequency is, the more you compress it the more predominant that frequency will be. Suppose the predominant frequencies are 1k to 3k. Put a compressor on it and the bottom end goes away, the top end disappears and you’re left with “Ehhhhh” [makes a nasal sound]. So for me, compressors can modify sound more than anything else. If it’s a bass guitar, you put the compressor before your EQ, because if you do it the other way around, you’ll lose the top and mids when the compressor emphasizes the spot that you EQed. If you compress it first, then add bottom, then you’re gonna hear it better. What Johns is saying is that if your EQ comes after the compressor, the two processes don’t affect each other. 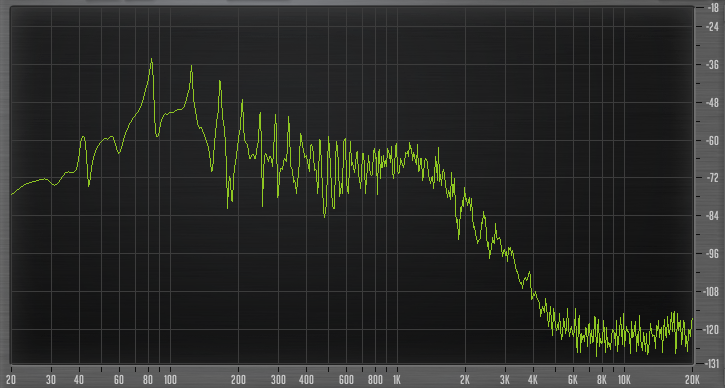 If you EQ before the compressor, then the compressor will further affect the tonality of your signal. Let’s take a look at exactly how this happens. Using a tone generator, I created two frequencies: 200 Hz and 2000 Hz, both set at -24 dB, shown in Figure 1 (the level of 200 Hz frequency appears to be a bit higher than the 2 kHz tone, but this is an effect of the spectrum analyzer. The two tones are at the exact same amplitude). 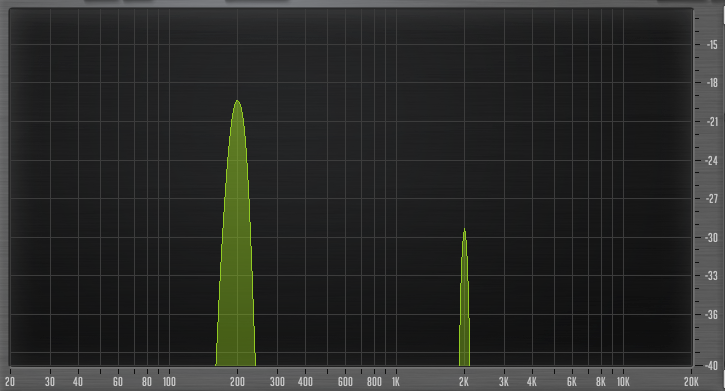 Then, to get a baseline, I increased the 200 Hz tone by 9 dB. Figure 2 shows the tone increased from -24 dB to -15 dB, while the 2 kHz tone remained the same. No surprises there. I then put a limiter on the master bus and set the attack and release long enough so that the processing didn’t affect the low frequency any differently than the high frequency. 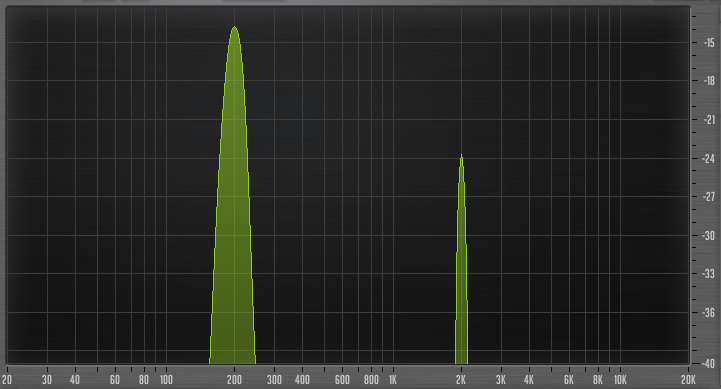 As I increased the input gain into the limiter the gain reduction increased. The output level of the summed frequencies out of the compressor increased a bit, but the relative level of the two frequencies remained the same. The view of the frequencies with the compressor on looked almost identical to when the compressor was off in Figure 1. Then, just to be thorough, I placed an EQ after the compressor, boosting the 200 Hz frequency by 9 dB. The level of the 2 kHz tone remained stationary as the 200 Hz was boosted, showing exactly what is displayed in Figure 2. Next I set the two frequencies back to the same original level and adjusted the limiter so that there was no compression, similar to Figure 1. I then increased the 200 Hz tone by 9 dB and captured the result in Figure 3. Of that 9 dB of gain at 200 Hz, 6 dB was taken by the limiter’s gain reduction and 3 dB went to the actual signal, increasing the low frequency from -24 dB to -21 dB. Now, here’s the “aha” moment: look at the 2 kHz tone in Figure 3. It’s down 6 dB, from -24 dB to -30 dB. Increasing the level of one frequency into the compressor decreased the level of another. So what’s going on here? Allow me to anthropomorphize the limiter to describe the effect we’ve just observed. With normal EQ, you boost the frequencies within a certain range and the other frequencies are unaffected. If you add a compressor after that EQ, you’re still going to get the same relative change in tonality, but the compressor can’t abide the gain increase, so it knocks the whole signal down. You keep pumping more of a certain frequency range into the compressor and it keeps reducing the overall level. The net effect is that the frequency range you’re boosting remains at about the same absolute level (EQ gain minus compressor reduction equals little to no net change) while the rest of your signal is suppressed (no EQ gain minus compressor reduction equals reduction). Given the relative levels of the two frequencies as shown in Figure 3 above, if I then began to increase the 2 kHz tone, the 200 Hz tone would show some reduction in level as well. The compressor basically makes the whole thing a zero-sum game. Whatever level you boost in one frequency has to partially come out of another frequency’s level. While this relationship holds true for the simple example of only two or so frequencies, the situation is a bit different for instruments with a more complex frequency spectrum. Take a look at the spectrum of an electric bass guitar note below in Figure 4. The fundamental frequency is 80 Hz. In the midrange, some 30 dB down from the fundamental, lives the “growl” of this instrument. With an EQ before the compressor, I had to add a healthy 24 dB of gain at 1.5 kHz (narrow enough to avoid affecting anything below 500 Hz) to have any effect on the 80 Hz region. What this means is that for any sensible amount of gain in a frequency region other than the predominant frequencies, EQ before the compressor is the same as EQ after the compressor (I double checked this and found that the two signals do in fact null). If, however, you want to affect the predominant frequencies of an instrument, the order of processing will make a big difference. With normal EQ, or EQ’ing after a compressor, all of the unaffected frequencies are anchored while you change the level of the frequencies affected. EQ’ing the predominant frequencies before a compressor has the effect of anchoring those frequencies you’re changing while adjusting the levels of all other frequencies. So it seems Andy Johns was right of course. Now what do we do with this information? Well, let’s think about the bass guitar shown in Figure 4. 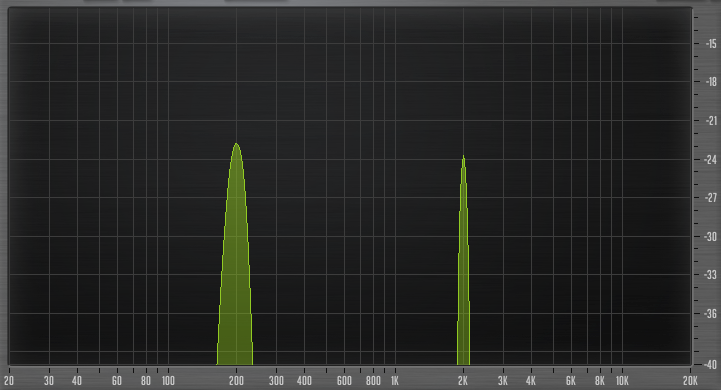 If I want even more low end I should EQ after the compressor. Doing otherwise risks suppressing the midrange growl and losing definition. If my compression is making the bass sound a little muffled I can add an EQ before the compressor and reduce the predominant fundamental frequency. If I wanted to add more midrange growl to the bass I could actually EQ before or after the compressor, as the level of those frequencies is far too low to have any significant effect on the compressor’s actions. You now know that there definitely is a consequence to the order of your processing, and even if you can’t make it work to your advantage, you know how to avoid having it work against you. 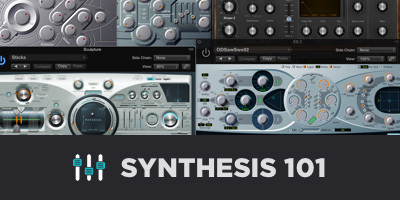 For more, check out 7 Resources for Learning Compression and Eric Tarr’s Analyzing Effects series. 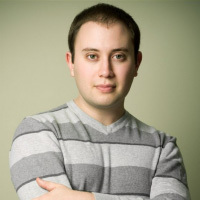 Barak Shpiez has earned several degrees in composition, audio engineering, and electrical engineering. His music can be found on programming on MTV, The History Channel, and more. Barak has also worked for several concert venues running live sound and as an engineer for Line 6 and DTS.